Students going into the arts need to build a portfolio, and they need to build it now! Why not build it free? I have created a new site, for free, through Weebly, and I have a guide to getting a site going and posting portfolio pieces. Visit 3dtrip2.weebly.com/ to find a guide to the practical steps to posting a portfolio site for free. Of course, the steps to create a portfolio site are easy, however creating a good portfolio is a completely different subject. This topic will be discussed more in the future, but a good start would be to look at successful professionals in the field you are studying, and see what their portfolios look like. Mimic them, heck copy their format if it is impressive to you, but whatever you do get started! 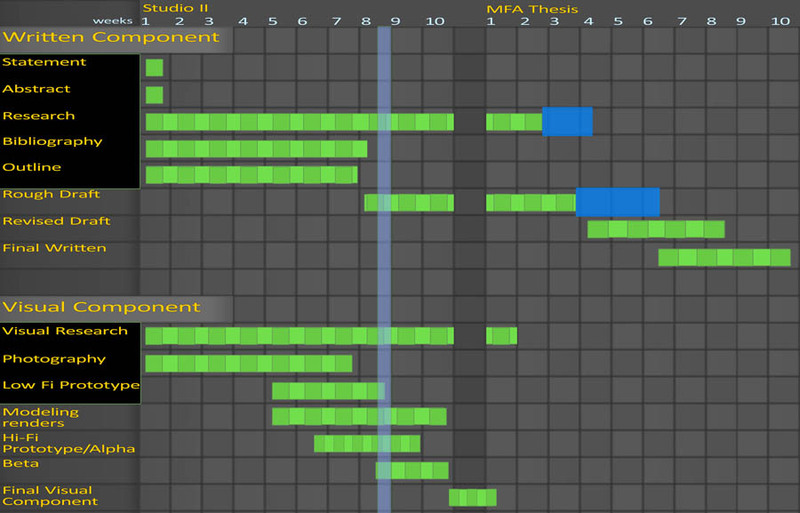 This is a new timeline condensed and representing for the final stretch of the MFA thesis. "Education should guide and perfect the development of the three periods, the two peripheral and the central; or, better still, since the process fundamentally reduces itself to the nerve centres, education should give to psychosensory exercises the same importance which it gives to psychomotor exercises. Otherwise, we isolate man from his environment. Indeed, when with intellectual culture we believe ourselves to have completed education, we have but made thinkers, whose tendency will be to live without the world. We have not made practical men. If, on the other hand, wishing through education to prepare for practical life; we limit ourselves to exercising the psychomotor phase, we lose sight of the chief end of education, which is to put man in direct communication with the external world." This statement could not be more appropriate for the day and age we are living in now where the virtual world encroaches into and indeed overtakes that which is real. Tactile experience may connect the student to the real material, driving them to appreciate their surroundings; perhaps driving them to go out and experience the real world more (even while creating the a virtual one). On a practical note, hands on real materials will allow for truly thorough observation of items. The student will be able to see by moving and touching the object, what the reflections really look like, how the smoothness of a surface changes the reflections, how bumpy the surface really is, what is the true color of the object according to their eyes, as opposed to the wide interpretation of the cameras sensor or monitor gamma correction. And they can play! I cut out the review portion and I have extended (blue) ﻿and moved things around﻿﻿﻿﻿﻿﻿﻿﻿﻿﻿﻿﻿﻿﻿ to reflect my current progress. biggest things that are changing is I want to be done with the visual prototype one week after break, and I am giving my self a bit more time for research. I am currently helping to develop curriculum at Purdue University and I have brought up an issue at almost every department meeting we have, here are the issues: 1) students do not know how to create, or what should go in a portfolio (most don't anyway). 2) even if students did know what to do with their portfolio, they are not required to make one till the end of the 4 years at Purdue! So lets think about this for a second; the goal of going to school is to get an education so that the student can have the skills to work in an area of interest, right? So instead of an early introduction of the concepts essential for building a portfolio, would we rather wait till the end of year 4? Do we then send them to confidence crushing career doom when they lack sufficient focus and content? Since I have been at Purdue I can not tell you how many portfolio reviews I have done where there is no focus, and really no work to show. So here is my rough proposal: A one week workshop at the beginning of the 4 year bachelors degree. 1 to 2 hours each night. Required for ALL students (if they don't show they don't enter the program). 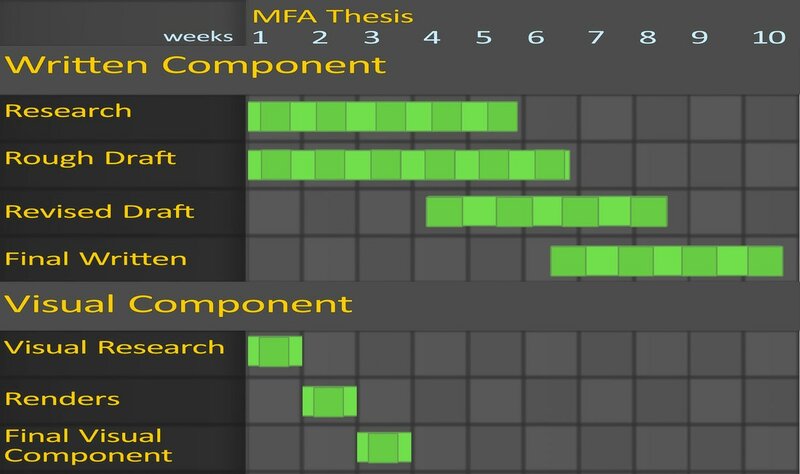 During the 1 to 2 hour lectures all professors from each discipline present information about who they are, what they teach, how it pertains to industry (jobs in that field), and what a professional portfolio for that field currently looks like. Then on the last day, Friday the students have to create a website on Weebly or something similar. The students have to hand in assignments through normal measures, and all assignments must be presented on their website in a page named after the class they are in and in a process book format (with specific requirements laid out by the professor). 1) Students will know what is expected of them in order to compete in the field, from day one. 2) Students will know and understand a number of different disciplines that are possible avenues for career pursuits. 3) Students will know their teachers! 4) Students will have a portfolio already being built through their coursework by the end of 4 years. At which time all they need to do is refine, remove and/or add to what they have, rather than wasting time trying to organize all of their past works. 5) Students can hand in an assignment via URL where appropriate. 6)Professors will be able to review ALL of a students work and make assessments regarding students strengths and weaknesses, allowing for better guidance. 7) Professors look good and get warm fuzzy feelings when their students succeed.